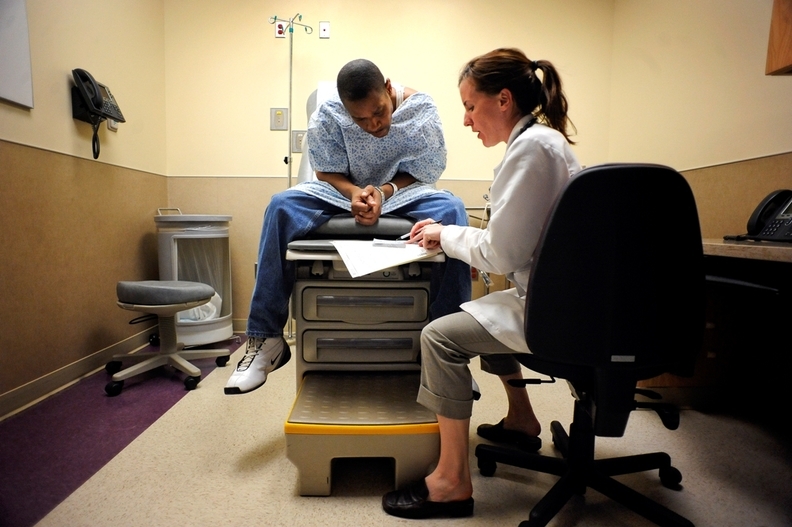 A Medicaid patient visits an urgent care clinic operated by Denver Health, a safety net health system that has a Medicaid managed care contract in Colorado. The House Republican proposal to revamp Medicaid financing would shrink federal payments to the states significantly over time, increase the uninsured rate and boost uncompensated care costs, experts say. The newly unveiled American Health Care Act, which will be marked up in two House committees Wednesday, would convert the $552 billion Medicaid program from an open-ended entitlement to a program of federal per-capita payments to the states that would grow slower than actual Medicaid costs. Starting in 2020, the bill also would phase out the Affordable Care Act's enhanced federal payments to states that expanded eligibility to low-income adults, which has extended coverage to more than 11 million Americans in 31 states plus the District of Columbia. Last year, states received $72 billion in federal payments for Medicaid expansion, according to Deborah Bachrach, a partner at Manatt Health and former Medicaid director in New York. The bill offers a compromise solution to the tough problem of different states receiving different levels of federal Medicaid funding based on their historical spending levels and whether or not they expanded Medicaid. But it's not clear whether state elected officials, particularly Republican governors, will find it acceptable, because any loss of federal Medicaid dollars would have a big effect on their budgets. Four Republican senators from expansion states said Monday they did not support a previous version of the House bill because it didn't adequately protect people who've gained coverage through the expansion. The shift to capped federal contributions would mark a historic change in the half-century-old safety net program for poor people, children, seniors, and the disabled, which has always been structured as an entitlement program for everyone who meets its financial, age, or health criteria. The Republicans' goal is to reduce federal spending growth and give states greater flexibility to design programs that serve beneficiaries cost-effectively. It's been high on the GOP agenda since the 1990s. Total Medicaid spending is projected to rise at an average rate of 5% a year over the next decade, slower than in the past but faster than general inflation, due partly to Medicaid expansion, the Congressional Budget Office reported last year. Per-capita spending growth is projected to average 3.6% a year through 2023, according to the Medicaid and CHIP Access and Payment Commission. Under the House Republicans' proposed per-capita grant model, starting in 2020 states would receive a fixed amount of federal money for each of five beneficiary groups. Then they'd have to decide who to cover, what benefits to offer, and how much to pay providers. But the proposal greatly worries healthcare providers and patient advocacy groups, who fear it will lead to sharply reduced funding over time, forcing states to slash eligibility, benefits, and provider payments. The American Hospital Association, the Catholic Health Association, America's Essential Hospitals, and the Association for Community-Affiliated Plans all have come out against the House GOP bill in its current form, citing concerns about the Medicaid changes. They urge Republicans to wait until the nonpartisan Congressional Budget Office scores the bill's impact on federal spending and coverage levels. “Radically restructuring the Medicaid program – with per capita caps or block grants – fundamentally undermines coverage for over 70 million poor and vulnerable children, pregnant women, elderly and disabled individuals in our nation,” said Carol Keehan, CEO of the Catholic Health Association, in a written statement. “Federal Medicaid funding caps simply shift the cost burden onto local and state governments, providers, and individual beneficiaries." A preliminary analysis from the rating agency Standard & Poor's projected that four million to six million people currently enrolled in Medicaid would lose coverage under the bill. The House GOP bill would use fiscal year 2016 as a baseline for each state's per-capita spending on the five beneficiary groups – the elderly, blind and disabled people, children, adult expansion beneficiaries, and adult non-expansion beneficiaries. Those baseline figures would be trended forward to fiscal year 2019. Starting in 2020, HHS would use that baseline to compare each state's actual per-capita spending with its spending target. The target would be set using the medical component of the Consumer Price Index, which experts say lags behind actual Medicaid per capita costs. A previous leaked version of the House bill had set the target growth rate at the higher rate of medical consumer price index (M-CPI) plus 1%. If a state's per-capita cost growth exceeded the target, the federal government would take back its excess payments by reducing its contributions in each quarter of the following year. The liberal Center on Budget and Policy Priorities estimates that the House bill would shift $370 billion in Medicaid costs from the federal government to states over a decade. Of that total, $253 billion would result from states losing the higher federal contribution for Medicaid expansion enrollees, since enrollment in the enhanced-funding program would be frozen in 2020. The shift to per-capita caps would cut federal Medicaid payments to the states by an additional $116 billion, because the per-capita growth rate based on M-CPI would lag behind actual Medicaid costs, said Edwin Park, vice president for health policy at CBPP. He said the M-CPI has been 0.2 percentage points less than actual Medicaid per-capita costs, while Atlas calculates the difference at 1.5 percentage points. Both say, however, that federal Medicaid payments would decline by about the same amount over a decade, with Atlas putting the federal spending cut at $387 billion over a decade. Federal payments would fall even more for states that decided to terminate their Affordable Care Act Medicaid expansions. That's because the enhanced federal contributions for the expansion population would no longer be part of the state's baseline spending level. Seven states have laws requiring them to end their expansion programs if federal payments are reduced. “The actual federal spending cut will be much larger as states drop Medicaid expansion entirely,” Park said. The House bill tries to soften the impact of the cuts by letting states that expand Medicaid by 2019 keep the enhanced federal funding for people who already were enrolled and stay enrolled. But for new enrollees, states would only receive their traditional matching payments from the federal government, which average about 60% across the country versus the 90% match under the ACA in 2020. To help states that didn't expand Medicaid provide care for the uninsured, the House bill would rescind the ACA's cuts in Medicaid disproportionate share payments in those states for 2018 and 2019. That would provide about $1.5 billion in extra funding, according to America's Essential Hospitals. Those DSH cuts would be repealed for all states starting in 2020. In addition, the House bill would offer $10 billion in funding from 2018 to 2022 for non-expansion states to increase payments to safety-net providers. But states would be on their own after that unless Congress voted to provide continued funding. Experts fear that under the GOP's per-capita formula, states would not be in a financial position to handle unanticipated higher costs due to epidemics, natural disasters, medical advances such as the new hepatitis C drugs, or demographic changes such as the growth of the frail elderly population. In addition, once the capped payment system was in place, Congress could decide to ratchet down the formula to produce greater cost savings, thus squeezing states, providers, and patients even more. That's what has happened in the past when Congress converted other social programs to a capped payment model. But the governors and other healthcare stakeholders may not have that opportunity. House Republican leaders hope to have a floor vote on the American Health Care Act as early as next week. And Senate Majority Leader Mitch McConnell says he wants the Senate to vote on it, perhaps without any hearings, before Congress breaks for Easter on April 7.